What’s on TV? With a range of apps, Internet browsing and all of your pay TV provider’s content at its disposal, the Logitech Revue box with Google TV ($300) delivers whatever you can think of. The Google TV software takes all of the content your pay TV provider delivers (including the on-demand offerings) and indexes it along with anything Google deems TV-friendly on the Web, so that you can easily find programming that you want to watch. Enter a show name, actor or topic in the Google TV search bar and you’ll see a list of live and upcoming programs from your pay TV provider, YouTube videos, Flash-based Web games and Web pages with relevant information. Clicking on a listing will bring you directly to the page or begin playing video. At launch, the Logitech Revue will also index any programs you’ve recorded with your DISH Network set top box. Another key component of Google TV is its apps. At launch, a number of them will be available including Netflix, Pandora, Napster, Twitter, Amazon VOD, NBA Game Time, CNBC Real Time and the full Chrome Web browser. 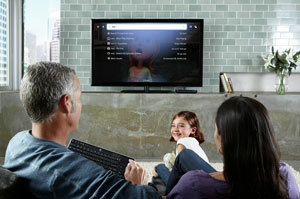 Sometime in 2011, a Google TV Marketplace will become available with apps designed for Google TV devices. Google says any app developed for Android phones that doesn’t rely on phone-specific hardware can be easily ported, so there should be a huge library of apps when the marketplace goes live. You’ll also be able to playback your personal content by connecting a USB flash drive with music, photos and videos or connecting to Windows 7 machines on your home network. 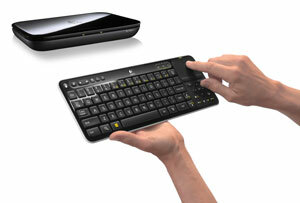 Inside the Logitech Revue box you’ll find the hardcover-book size Revue and a Logitech Keyboard Controller. The Revue connects to your pay TV provider’s set top box and then into your TV. The Keyboard Controller has a full QWERTY keyboard, video playback buttons, a directional pad and a touchpad, and uses an RF signal to communicate wirelessly with the Revue. The Revue passes along any commands to your pay TV provider’s set top box through an IR repeater. The Keyboard Controller also functions as a universal remote control, leveraging Logitech’s impressive Harmony technology. Having set up and used Harmony universal remotes, I can vouch for how easy they are to set up and customize to the way you want to control your devices. In addition to the Keyboard Controller, you can purchase am optional Mini Controller ($130) or download the free app for your iPhone or Android phone. Revue also works with the Logitech TV Cam ($150) and the pre-installed Logitech Vid HD app for HD video chat with other Vid HD users on PCs, Macs and other Revues. 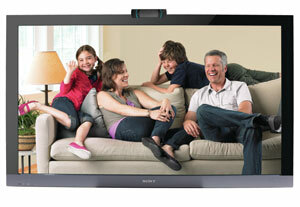 Like other TV webcams, the Logitech TV Cam has a wide angle lens and two directional microphones to easily cover a family sprawled on the sofa. When calls come through, you’ll receive an on-screen notification with caller ID. And if you miss a call—even if the TV is off—an LED light on the cam will let you know. All of these products are available for pre-order with delivery expected by the end of this month.